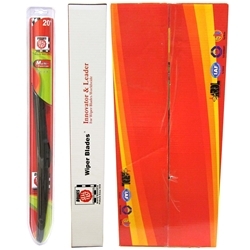 Hybrid-R 20" Wiper Blades BOWES WB 28320 Case of 10. Up to 40 percent longer life with exclusive fx dual rubber resists heat and ozone deterioration to remain flexible in all weather conditions. Asymmetrical flexible spoiler distributes uniform downward force along the entire blade to hold it firmly to the windshield.Exclusive tension spring arcing technology creates a fit that's custom-contoured to the curvature of each side of the windshield.